Why Is Wrangthorn called Wrangthorn? This month there is a mention of a special service at Wrangthorn (St Augustine’s Church) Hyde Park Corner, and people may wonder why the church is called Wrangthorn. It is the name of the hamlet situated in the 1600’s at the bottom of Cliff Road, and we have been told it referred to an area of “twisted” (wrang) thorn bushes where vagabonds lurked to steal from the traders bringing their goods to Leeds market by way of the woodhouse (Pikeman’s) ridge and the still existing ginnels or passageways. In 1612 the boundary between “the Lordships of Headingley and Burley and the Manor of Leeds” came down from Buslingthope Lane, along Sheapscar Beck and up the ridge, “where a hedge planted with trees” proceeded south (more or less along the ginnels and back to Regents Park Close) to Wreghorne Stile at the side of the Common and Waste then down to what is now called Hyde Park Road. The “Common and Waste” must be a reference to Woodhouse Moor. This had been common land since 1086 so the stile must have been very close to the site of our church. In the middle of the 1700’s John Wesley visited Woodhouse to establish a Methodist class meeting in a cottage in Wraghorn an area just north of Woodhouse. A book of northern counties folklore tells of a shaggy black dog that haunts a piece of wasteland between Wreghorn and Headingley Hill near Leeds. In 1865 the area was in need of a church and school. The school was built near the bottom of Cliff Road and was Wrangthorn church school until just after the 1939 war. In 1865 the Parish of Wrangthorn was formed and the Rev James Boultbee placed in charge. When discussing the name for the church the committee realised that the date was St Augustine (of Hippo) Day. They also realised that the first child to be christened was named Augustine. That settled it. 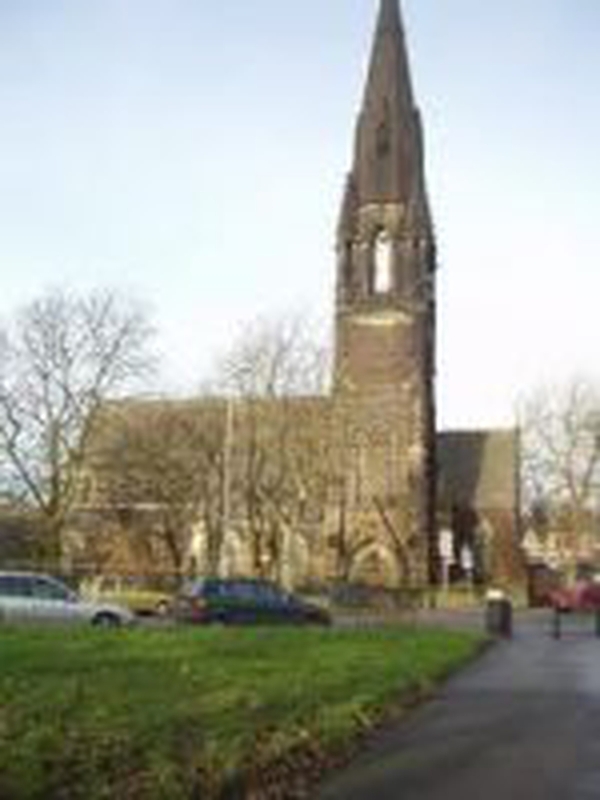 There is a Roman Catholic Church in Harehills called St Augustine’s so to avoid confusion the name of the Parish was normally used. This is a personally researched article. We are pleased to receive comments or additions. Copied From Draft Consultation For Headingley Hill, Hyde Park and Woodhouse Moor. Prior to the middle of the 19th century Hyde Park and Headingley Hill did not have an identity of their own. They were simply part of the wider Headingley Manor, later the Headingley plus Burley Township. Headingley remained a separate ‘out township’ until incorporation into Leeds in 1836 as a ward under the Municipal Reform Act. Woodhouse Moor as its name implies was simply an area of uncultivated common land on the edge of the Manor / Township of Leeds while Woodhouse Ridge was another area of common land on the edge of Meanwood valley which straddles both townships. (See John Tukes Common Land Extract of 1781). Addn) This shows a hamlet at Hyde Park corner on Cinder Moor. The first written evidence of early Headingley appears in the Doomsday Book of 1086 where it is referred to as the “Manor of Headingelia”. At the time of the Doomsday Book ownership was with Ilbert (Albert) de Laci (Lacy) and held under the De Lacy’s until 1314 when it passed to John De Calverly who in turn gave it to Kirkstall Abbey in 1324. Headingley remains part of the Kirkstall Abbey until the dissolution of the Monasteries, in 1540, when the land was granted to Thomas Cranmer. In 1773, the Brudnells sold off 200 acres of land between Headingley village certre and Woodhouse Moor, the area now known as Hyde Park, to john Walker. When John Walker’s descendant Mary Bainbrigge died in 1805, the estate was split up and the land progressively sold off in large building plots from 1820’s onwards initially on sites flanking Headingley Lane which formed part of the Leeds Otley Turnpike after 1754. Woodhouse Ridge to the north-east and Woodhouse Moor to the South East both remained open areas of common land. Woodhouse Ridge includes an area of ancient woodland between Cardboard Hill and Bedford Fields known as Batty’s Wood but previously referred to as ‘Pikeman’s Ridge’ due to its Civil War connections. “I was appointed Minister to this parish on December 7th 1866. In this Church may the pure word of God ever be preached. Salvation through the merits of our Lord Jesus Christ ever to be proclaimed. May this stone cry out of the wall if ever a mixture of popish error, ritualistic nonsense or rationalistic uncertainties find place within these walls. In 1866 the Church Extension Society paid £1,000 to a Mr C Pickard for the site of the church. In order to accommodate congregations whilst new churches were being built the Church Extension Society provided for temporary and movable iron churches, each to hold 300 people. In 1867 the Church Extension Society purchased an iron church as temporary accommodation for the local inhabitants of Wrangthorn to use for worship. Under Robert Peel’s Act a new church could be set up “if there was no church and no room within its bounds at all suitable to be licensed for divine worship”. In their report of that year the Society said they trusted” that in so wealthy a neighbourhood funds would shortly be forthcoming whereby a permanent structure may be provided and an iron church set free for the use of some more needy part of the town”. In fact, when the nave of the present church at Wrangthorn was completed and could be used for services the iron church went to Roundhay to start off St Edmund’s Church, or possibly St. Hilda’s, Cross Green - opinions vary. The temporary church housed 300 people and was licensed on 13 February 1867. and opening on 15 February for evening service. It was placed at the east end of the present church running north and south. The first vicar was the Reverend James Boultbee. By August 1867 a Sunday School was operating from the iron church. The first effort to raise funds for the erection of the new permanent church was made on 28 August 1867 when a service was held and a sermon preached by the Bishop of Ripon. The collection after the service raised £10.18.5½d. As 28 August was the date when St Augustine of Hippo was remembered and also the fact that the first child christened in the iron church had been called Augustine it was decided to adopt this name for the church. The building of the new church started at the end of August 1869. On Monday 6 December 1869 (1870?) a foundation stone was laid in the tower by the then Vicar of Leeds, Canon Woodford. It was expected that the church would cost £6,000. Litany was sung in the iron church and the congregation processed to the stone singing ‘Christ is Lord the Sure Foundation’. Most of the interior decoration and artefacts were given or paid for by members of the congregation. The font was given by the architect, Mr James Fraser, the pulpit by the ladies of the congregation and the communion table by the gentlemen of the congregation. The brass eagle lectern was given by the architect’s wife, but this was stolen in the 1990s. A bazaar held over Easter week 1876 in the Town Hall to raise money for the rest of the building raised £1,344.16.3d. The church was consecrated on Wednesday 8 November 1871. An article from the Evening Post of the same date states that following the consecration services a lunch for upwards of 100 ladies and gentlemen was held in the Grammar School. Apart from a large choir 40 strong, the church had its own athletics club, cricket team, football team and uniformed organisations. The church also had its own school at the corner of Cliff Road and Cross Cliff Road, now residential apartments. The pews at the rear of the church were removed in 1979 to allow for hospitality and fellowship. The front two lines of pews were removed in1976 to allow room for music groups and disabled access. The seating capacity of the church of 650 reached the target set by the Extension Society in 1866, namely of 25% of the population of the Parish. The number of pews was certainly needed as the population of the Parish of Wrangthorn increased by four times in the first 30 years from an estimate of 2,500 to 10,000. The architect was James Barlow Fraser. The arcades separating the nave and aisles have short columns of Shap granite. There is a wagon roof over the nave and chancel. The stained glass window in the east and the Chellaston alabaster mosaic reredos were designed by James Fraser as a memorial to his brother John who died in 1881. The reredos was completed in 1882 by John’s daughter as a memorial to her parents, John and Harriet. The pulpit and font are of Caen Stone and coloured marble, the font being given by the architect. There is a short statue of St Augustine of Hippo, the first great African Christian in the chancel. Other architectural features are the 8 heads of Saints decorating the nave arcades, angels in the stained glass windows and elsewhere and the instruments of Christ’s passion on the chancel walls and ceiling. The west window is in plain glass, the money having been raised for stained glass but used instead to build the church hall in 1934. The spire, which is 185 feet high, was the last phase of the main structure, being completed in March 1878. In January 2012 Wrangthorn partnered with St Georges Church. The core of the world as we know it was discovered in the later Middle Ages. A common perception is that people stayed at home and eked out their miserable existence with local produce. The Vale of York hoard contains coins from as far away as Samarkand, Afghanistan and Russia, held together in a vessel from France or Germany. Spices, such as pepper, cinnamon, nutmeg and ginger from far-away lands were well known and used in 14th century England - even in non-royal households. In the early medieval era Leeds was a relatively small place. Kirkstall Abbey was then a journey in the country about four miles away from the large village but Leeds was in an important place. It was on a river that was navigable. It had a Borough that allowed it to develop. Leeds grew in size from the 16th century onwards especially on the back of its wool trade. Leeds gained a market charter very early back in the 1200s and was an important trading centre. People think that in medieval times everybody lived very close to their home village and rarely travelled anywhere else. That's a mythical view, there were routes to service long-distance communications and those routes included Leeds. There was a long established route from Leeds to York and on to Scarborough, which was an important port. Other main routes were used to service the township as an agricultural unit. To give it access to the farming resources needed like arable areas and grazing. There was a system in place to repair the roads, until the mid 16th century it was the responsibility of the people that lived in the township. The main traffic was horses. Horse and cart moved all goods. This traffic was important. Contemporary horse breeding was sophisticated and produced a whole range of horses, differently sized to do different jobs. The general carrier or packhorse animal was a Sumpter (a word that also came to mean the person the drove the animals). There was a range from the humble carthorse to the hunter and warhorse, and an infrastructure keeping the medieval world moving. To understand the medieval system of route ways you can see it in the landscape and by looking at the documents that exist I also 'reconstruct' the medieval landscape and you can begin to understand the system. It has only been realised in the last year or so the relevance of the name Little London. Our own is a half mile away. Historians have found reference to many Little London and even more whose name has ceased to be used today. The medieval drovers needed a safe haven for themselves and their flocks so it appertained to a corralled area with amenities and comforts for safe travelling. A pictorial 3d crows eye view of Leeds is in the Armley Mills Museum. It is about six foot across and shows Leeds in the 1880’s. This view has Wrangthorn and St Hilda’s Churches in its details. St Hilda’s has our ‘Iron Church’ next to the left of the main body of the Church. It was licensed for our use on 13th February 1867. It is a proper little church with a square tower. The Architect was Morton of Liverpool and the main contractor was Joseph Pyles and Company of Leeds. 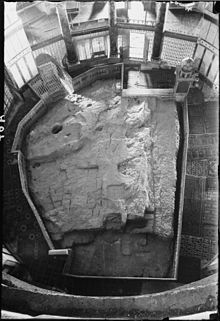 The Church was 62ft long 32ft wide and 30ft tall and held 300 people. It had six side windows. The interior walls were panelled and varnished. There was an ecclesiastical pulpit. The ceiling was white. It had open seats. There appears to be a large window in the area of the Chancel over the Rearedos and Altar. It was licensed for St Hilda’s use on 11th November 1873. The Leeds Church extension society supplied it. After residing here for some years, a lightning strike weakened it considerably and it had to be demolished. The vicarage now stands on this site. It is worth considering a visit to view the map as it shows Wrangthorn at that time with very little housing about it. Unfortunately, the dates when the present organ was built and later rebuilt are not known. It is known that there was a previous organ built by Bevington, a well-known 19th-century English organ builder. The stop-list of the Bevington organ was for a 3-manual and pedal organ and was quite ambitious for an English local parish church in the mid-19th century. One authority has described Bevington pipework as being of such good quality that it is well-worth re-use when their organs come up for rebuilding. Interestingly, the stop-list of the present organ is very similar, although not identical, to that of the Bevington organ, so much of the present pipework may well be from the earlier instrument, although this has never been confirmed. The present organ, also a 3-manual and pedal organ, was built by the Leeds firm of Abbott and Smith (1869 – 1975) who had their factory in Blackman Lane. They have a reputation for having built organs that were robust in terms of both sound and construction and the present organ is a very good example of both these aspects. In spite of its age (around 100 years, possibly older), it is still giving very good service and delivers a splendidly authoritative sound across the full range from ethereal, through mellifluous to full blooded majesty and excitement. Originally, the console was under the pipework on the south side of the choir stalls but at some point the organ was rebuilt with a detached console behind the north choir stalls and recessed into the choir vestry. There are 43 stops distributed over the 3 manuals and pedals; 32 are sound-producing stops, the rest being couplers and tremulants. There are just short of 2000 pipes, varying in length from 16ft to about 1.5 inches.